The Koeye Lodge can be seen facing upriver on the center of this point of land at the mouth of the Koeye River. The 44,500-acre Koeye Watershed was first identified as an area of critical ecological importance in Coastal Watersheds: An Inventory of Watersheds in the Coastal Temperate Forests of British Columbia, a 1991 report published by Ecotrust with the Earthlife Canada Foundation and Conservation International. Well-attended celebrations on August 9–11, 2001 marked the return of a pivotal, 183-acre tract of land at the mouth of the Koeye River, British Columbia to First Nations' control. Singing and dancing, speeches and salmonbakes filled the day as hundreds of people attended ceremonies in which the Heiltsuk and Owikeeno people expressed their traditional interests in protecting the Koeye River Watershed and surrounding lands. 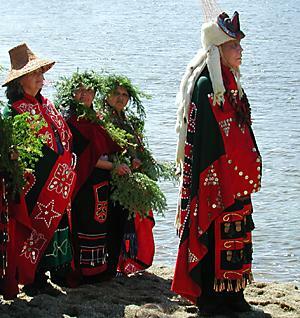 Joining the celebration were representatives of indigenous peoples from across the Pacific and along the west coast of North America, including the Ainu, from Hokkaido, Japan, the Agua Caliente, native to Southern California, the Siletz and Warm Springs of Oregon, and the Kwakwaka'wakw of British Columbia. "What we are doing is the first step to gain control of the territory that we own and the resources that we own," said Qvíltákv (Edwin Newman), a Koeye Hereditary Chief. 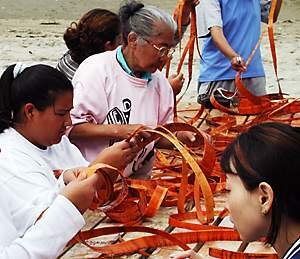 Evelyn Windsor teaches cedar basketweaving at a Heiltsuk Youth Camp. Heiltsuk teens have for four years been learning cultural traditions at this camp near the mouth of the Koeye. The purchase of the Koeye Lodge and its land was made possible by a generous pledge from US philanthropists Howard and Peter Buffett. Financing of the $1 million (Canadian) transaction was provided by Ecotrust's Natural Capital Fund. Efforts by Ecotrust Canada, Raincoast Conservation Society, and The Land Conservancy of British Columbia to help the Heiltsuk and Owikeeno secure the land from further development had been under way for some time. "We are happy to be able to facilitate this just transition of ownership," declared Ecotrust President Spencer B. Beebe. Two previous owners logged the land and then built the hunting and fishing lodge. The lodge never operated commercially, in part because of the Heiltsuk's opposition. Koeye Hereditary Chief Qvíltákv (Edwin Newman) and a group of Elders await the arrival of a boat symbolizing the return of the land to local control. Most of the rest of the 44,500-acre Koeye Watershed is Crown land, subject to a Tree Farm Licence held by Weyerhaeuser, whose support for appropriate conservation plans have been welcomed by environmentalists and First Nations' peoples alike. The Great Bear Rainforest Agreement announced on April 4th of this year listed the Koeye as one of twenty critical watersheds to be protected. The Agreement, reached by a group of environmental organizations, timber companies, First Nations' representatives and BC NDP government officials, endorsed a plan to permanently protect these twenty watersheds while deferring the logging of a further sixty-eight watersheds. 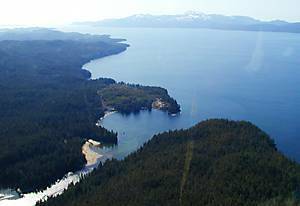 First Nations and Conservationists Purchase Key Property in the Great Bear Rainforest on the Ecotrust Canada website. Our Natural Capital Fund makes investments in projects which significantly enhance the capacity for appropriate development and conservation in the coastal temperate rain forest region. This map of BC Central Coast Land Use Designations shows the locations of the watersheds protected under the Great Bear Rainforest Agreement.